Transfer Factor RenewAll is a powerful healing and cell renewing gel that provides natural immune protection for the skin. This scientifically advanced product includes immune activating ingredients like Transfer Factor XF®, beta glucans and aloe vera to keep your skin smooth, soft and healthy. As the largest immune organ in the body, the skin serves as our first line of defense against the millions of invading germs that threaten our health and well-being. This advanced formula is especially helpful for problem skin conditions, cuts, bruises, scrapes, burns, bug bites, rashes, minor irritations and after shaving. The extraction process for transfer factors from colostrum is protected by US patent 4,816,563. I take 4Life Transfer Factor Plus Advanced Formula to support my immune system. It’s been great, especially in terms of providing balance to my immune system. 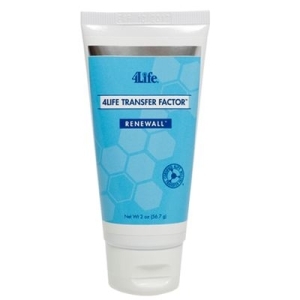 I also started using 4Life Transfer Factor RenewAll and Aloe Vera to promote healthy skin. Both of these products help keep my skin soft and healthy. Recently, I placed a cup of water in the microwave to heat it for coffee and accidentally placed more time on it than planned. When I went to take the cup out it exploded and scalded part of my face, right side, and my stomach area. It was burning terribly. I put 4Life Transfer Factor RenewAll on it and I really feel like this product helped support my skin’s natural healing function. "I have fallen in love with the TF RenewAll gel and so has my son. I recommended that he use it for his facial pimples and now I can't get the bottle back from him. He uses it all the time to help with pimples and blackheads. I apply the gel around my mouth and under my eyes. Tremendous results have taken place in our family." "I get razor burn a lot when I shave. I put Transfer Factor RenewAll on the razor burn and it improves dramatically in two to three days, rather than eight to ten days like it normally used to take." "I injured two of my toes, causing the skin on my big toe to peel back, which left an open wound about the size of a quarter. I applied TF Immune Spray and the TF RenewAll gel, and I think these products helped the skin to heal much better. In less than a week it looked very good. "